Congratulations to winners of the CFUW/Kanata scholarships-2018. These students –from secondary schools in Kanata, Goulbourn, West Carleton areas are all heading to universities and colleges this fall. This year’s recipients are Blaze Burgess-Woodley - A.Y. Jackson S.S.; Hayley Chown - Earl of March S.S.; Arianne Chartrand –Frederick Banting Alternate School; Sarah El-Kass -Ecole Secondaire Maurice-Lapointe; Lauren MacLellan –South Carleton H.S. ; Zoe Amyot –West Carleton H.S. ; Jennifer Rasp –All Saints Catholic H.S. ; Jillian Key –Holy Trinity Catholic H.S. ; Haley Bowditch –Sacred Heart Catholic H.S. These dedicated students have maintained high academic standing, overcome personal challenges, and participated in a wide variety of extracurricular school and community activities. We wish them every success as they pursue their post-secondary studies. Congratulations to four excellent students in our community. They are this year’s recipients of CFUW/Kanata’s scholarship awards for high school graduates who are pursuing post-secondary education. This year’s recipients - Ayla Suprey from Holy Trinity HS, Elsie Galley from South Carleton HS, Holly Pacholik from Sir Frederick Banting Alternate HS, and Susannah Finan from All Saints HS - are impressive young women who have overcome many personal challenges to graduate. They have all maintained high academic averages, participated in many school clubs, and demonstrated leadership to other students. One student is going on to study Criminology and Criminal Justice; another is registered in Concurrent Education. One of the recipients is going to Toronto to study Cosmetics and Cosmetic Management. The immediate goal of one of the students is to become an esthetician. She is self-supporting, so working as an esthetician will allow her to earn and study, and pick up credits to become a social worker which is her ultimate dream. NOTE: This year, two college bursaries were awarded since no college award was given in 2015. In addition, the Scholarship Committee found extra private funding this year to provide a third university scholarship. 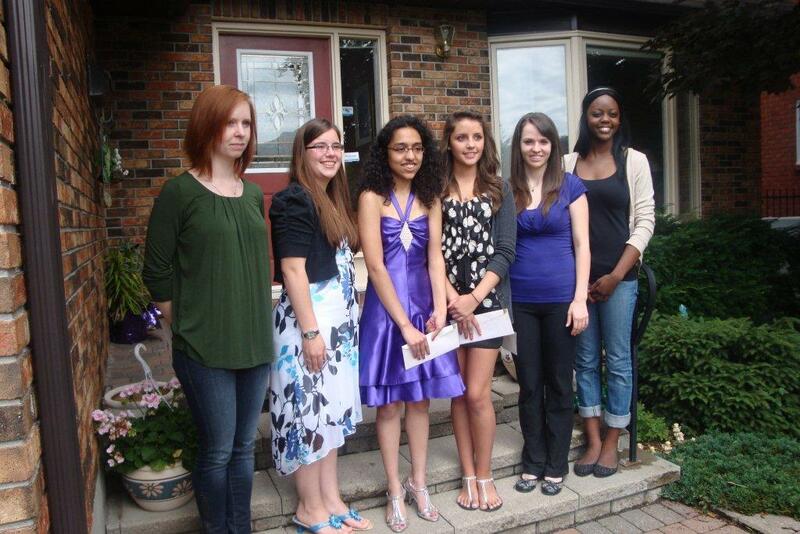 This year CFUW/Kanata offered two $2000 bursaries to young women graduating from area high schools. From the seven worthy candidates nominated by their teachers from local high schools, we are delighted to announce the two outstanding winners. Carmen Ho from Holy Trinity Catholic High School always worked hard, gave her very best and persevered in order to achieve optimal results. Besides volunteering as a tutor for younger students, being a leader at summer camp and helping out at the Soup Kitchen, she was a member of the Reach for the Top Team. She was also presented with the Governor General's award for achieving the highest marks in grades eleven and twelve. Carmen will be studying Biomedical and Mechanical Engineering at Carleton University. Lara Weeks from Earl of March High School was also awarded a bursary at the CFUW/Kanata Awards Tea held in June. As head organizer for the Earl's Leadership Camp, she developed her leadership and communication skills, problem solving, goal setting and interpersonal skills. Being a counselor at Camp Otonabee was the most rewarding opportunity she's ever experienced. By helping kids develop their own citizenship, teamwork and leadership abilities, it helped her personal achievement. Her greatest sense of joy is to learn and understand what is going on in the world. Lara will attend the University of Guelph in Environmental Sciences. Molly Egan from All Saints Catholic High School has received a Student Choice Award, the Principal's Award for student leadership, honour roll, and has graduated with a Bilingual Certificate. She contributed greatly to the math programme for younger students, the Arts Council, Drama Dept. She was a member of the Improv A Team who placed first overall in Ottawa and 6th in all of Canada. Molly will attend The University of Guelph in the fall studying Zoology. Alexis McMorran from Sacred Heart Catholic High School achieved academic success through dedication to her education, putting full effort in every task, Her accomplishments include Honour Roll, French Immersion Programme, volunteering at Granite Ridge, Peer Ambassadors,Tutoring, School Book Club besides part-time employment. Alexis will be attending the University of Ottawa studying Chemical Engineering. Sophie Jacques from South Carleton High School will be attending Carleton University for Psychology in hopes of getting her Ph.D. and opening an art therapy business. Her accomplishments and volunteer work include Honour Roll, volunteering at a tea room for seniors as a waitress and a cook in Manotick. She enjoyed working at a summer creative writing camp and did weekly pottery classes for children. Shannon Slade, Holy Trinity Catholic H.S. kept an above 90% average for all 4 years of high school and won several academic awards. Besides student council treasurer, she participated in the Waterloo Math competitions. 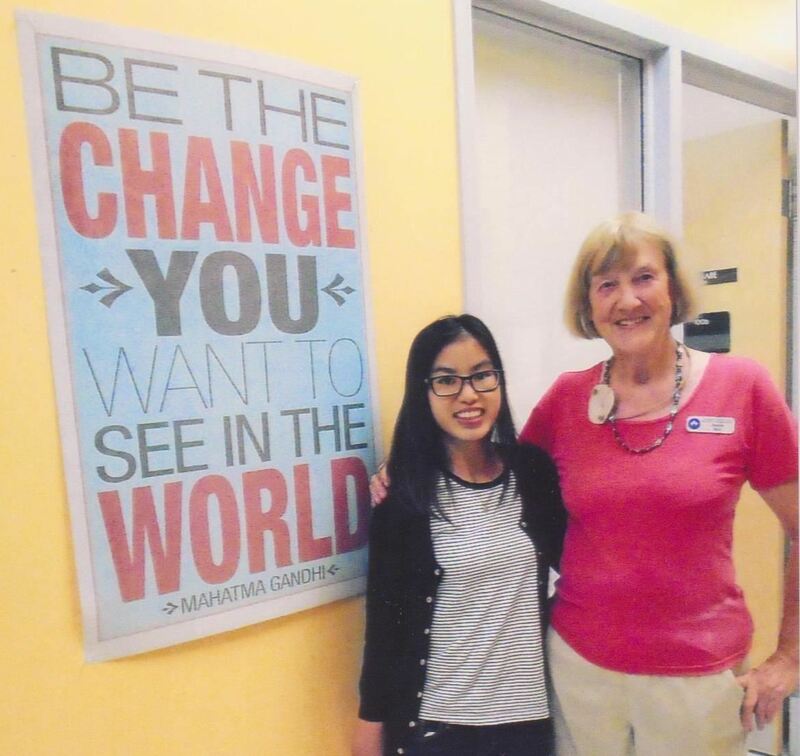 She did volunteer work and co-op at Kanata Optometry Clinic as she wishes to become an optometrist. Shannon is a competitive dancer who also teaches dance to younger children. Shannon will continue her studies at Queen's University: Bachelor of Science Honours majoring in biology. 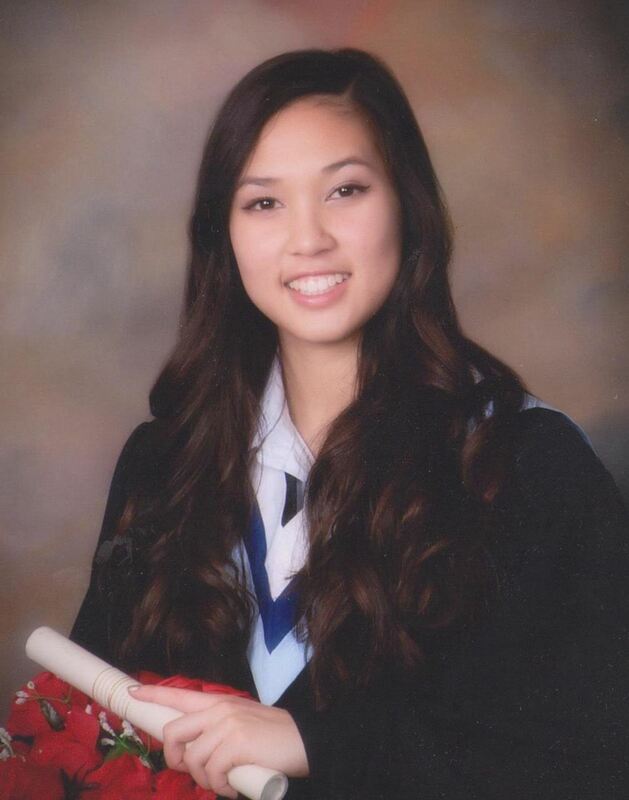 Alice Dodds from West Carleton S.S. will attend Trent University: Honours Bachelor of Science. She was an active participant at W.C. She was on the Honour Roll, took part in Relay for Life, Link Crew Leader helping grade 9 students begin high school and also helping run their orientation. She enjoyed the Eco-Club, Peer Assisted Learning and Leadership Camp. Allie Thibault-MacDonald, Earl of March H.S. has been accepted at Carleton University for a B.A. in Sociology. She has worked two jobs while attending high school and was able to keep up her marks and her overall average. 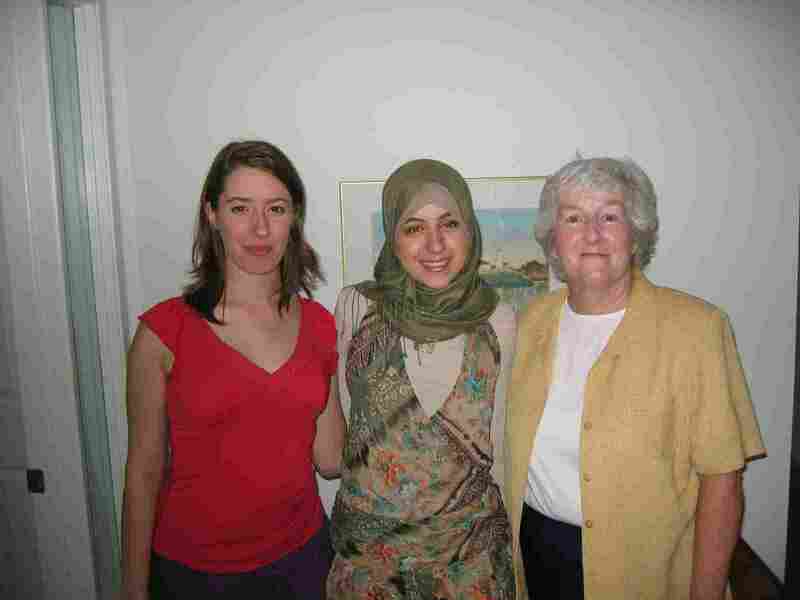 She is an active volunteer in the Hemophelia Society as well as certain non profit housing organizations. Also Allie had the opportunity to volunteer at the Mission and at a women's shelter. School and Education are very important to her and she cherishes her experience. Saania Tariq, A. Y. Jackson H.S. has been accepted at the University of Ottawa for a Bachelor of Science, Honours in Biomedical Science. She maintained the honour roll for all 4 years of high school. She served as goalie on the Varsity Girls Field Hockey and also as Captain in Grade 12. She led the A.Y.Jackson Youth Troop, wrote for the school newspaper as Sports Editor as well as student council rep. Saania volunteered at the Queensway Carleton Hospital and also with various groups and organizations. 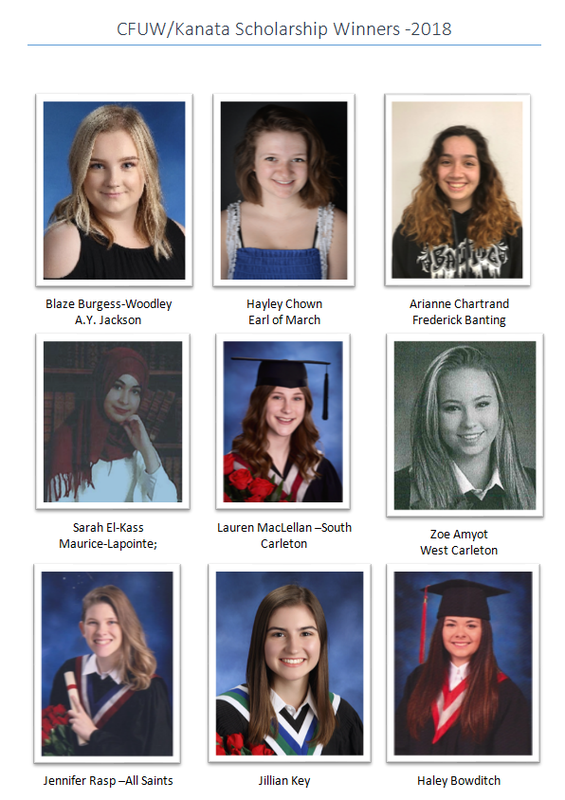 The Canadian Federation of University Women/Kanata (CFUW) is pleased and proud to announce they have presented seven $1000.00 scholarships to outstanding young women graduating from seven local high schools. The recipients all have excellent academic standings, have been accepted to university and have made significant contributions to their schools and communities. 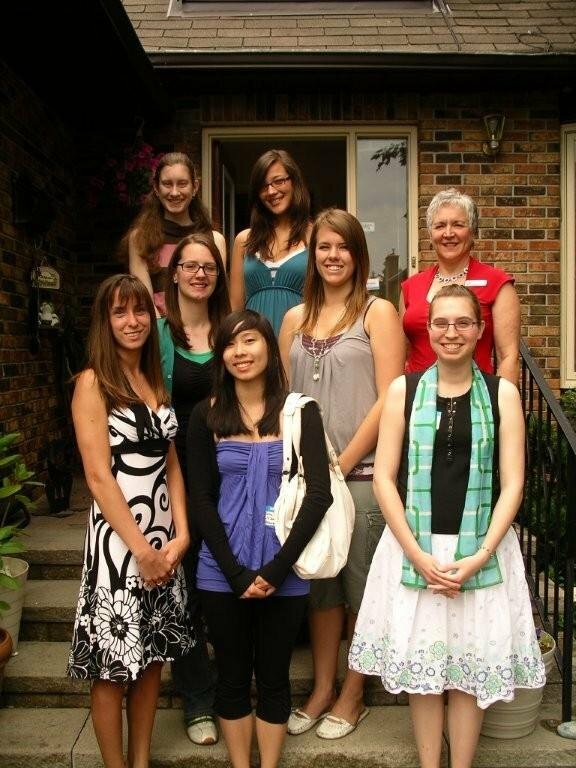 The scholarship winners, their guests, the CFUW scholarship presenters and Sandy Burger, the 2012-2013 CFUW/Kanata President attended a tea on Friday June 21st at the home of Derryn Few the CFUW/Kanata Scholarship Convenor. The scholarship awards were presented at the various graduation ceremonies which took place in the last week of June. 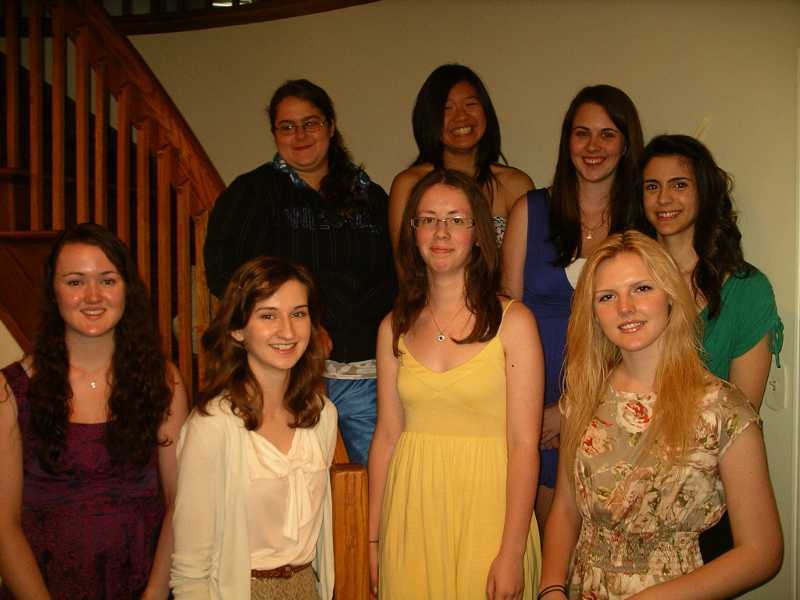 Front Row left to right: Emma Brown - Earl of March, Jordan Scott - Holy Trinity, Kassie Williams - West Carleton, Alena Thor - All Saints, Derryn Few - CFUW Kanata Scholarship Convener. 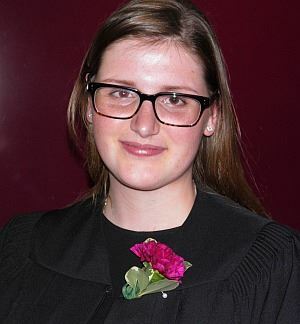 Hannah Driver, a graduate from South Carleton, won a silver medal for having an above 90% average in grades 9 to 11 along with various subject awards. 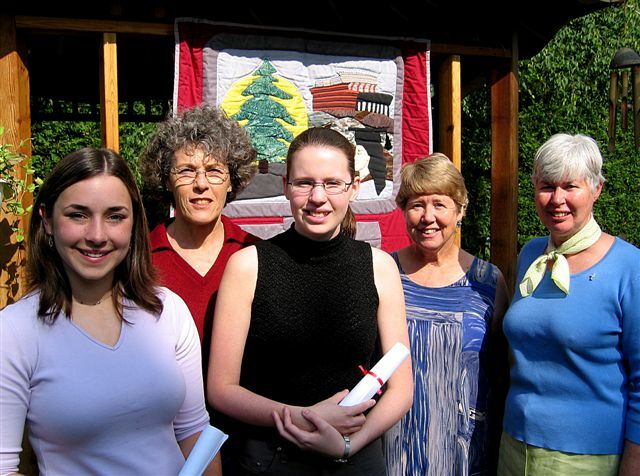 At her graduation ceremony she won the Governor General’s Academic Medal. She was an active participant in the DIFD (Do It For Daron) fundraisers. In her spare time she was a Tier 1 hockey player, most recently for the Ottawa Jr. Lady Senators. She volunteered in a program to help children develop hockey skills as well as tutoring students in Math and Science. Hannah will be attending Queen’s University in a Bachelor of Science Honours Program. Alena Thor, a graduate from All Saints, has competed in the Waterloo Math Competition for several consecutive years. She achieved a 96% average for her first semester in Grade 12. As an academic tutor for the last four years she has been teaching difficult math and science concepts to students. Alena participated in several school clubs including the Hyperscience Team and Speak Up. She volunteered at the Queensway Carleton Hospital in the Mother-Baby unit and at the Walden Village Seniors Residence helping the residents in the area of technology. Alena will be attending Queen’s University in the Bachelor of Science Nursing Program. Amber Macey, a graduate from Sacred Heart, maintained a position on the honour roll throughout high school. This was achieved while working over 20 hours a week at her part time job as a supervisor at Sobey’s. She has won a best sportsmanship award in track and field. Amber worked with the Legion to sell poppies at local stores and helped to organize a Canadian Blood services event at her school. She has chosen the health field as it will enable her to improve the lives of others. Amber will be attending the University of Waterloo in the Health Promotion Program. Kassie Williams, a graduate from West Carleton, has been a participant in many of the sports at West Carleton including volleyball, basketball, rugby and softball. She was a Link Crew member which helps grade 9 students to transition into high school. Throughout high school Kassie volunteered for various community events for the Kinburn Community Centre and the Bethel United Church. She will be attending Carleton University in the Commerce Co-op Program. Jordan Scott, a graduate from Holy Trinity, maintained a 90% plus average in math and science and was on the honour roll for all four years of high school. She was an assistant coach for her school swim team, a member of the concert band and in the school choir. As a member of Scouting she has volunteered with the food bank and recently completed her Queen’s Venturer and Duke of Edinburgh awards. 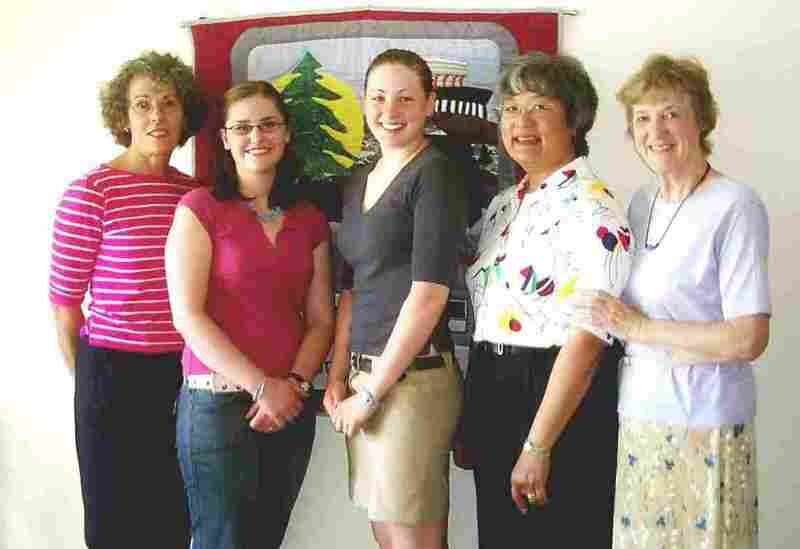 Throughout high school she has tutored students in math, science and French. Jordan will be attending Carleton University in the Bachelor of Science with Honours in BioChemistry program. Madison Sweeney, a graduate of A.Y. Jackson, won awards for the highest average in grades 9, 10 and 11. She maintained an above 90% average for all four years of high school. Madison founded, edited and wrote for an independent school newspaper. She was a bass guitarist in the school band as well as being a Cappies Critic and a member of the Reach for the Top team. She has also volunteered for the Glen Cairn Community Association. Madison will be attending the University of Ottawa in a Joint Honours in Political Science and Communications Program. Emma Brown, a graduate from Earl of March, spent much of her childhood living abroad in Singapore and Vietnam before returning to Canada to start her grade 10 year. She was chosen to become a grade 12 leader for the Link Crew program helping grade 9 students adjust to high school. Emma volunteered as a canvasser for the Canadian Cancer Society and helped organize fundraising events for the worldwide charity, Free the Children. She joined the Student Emergency Response Team at school earning certifications in Standard First Aid and CPR. Emma will be attending Western University in the Food Science and Technology Program. The members of the Canadian Federation of University Women Kanata congratulate the scholarship recipients and wish them success in their chosen university programs! All the money for the scholarships is raised by the CFUW Kanata through various fundraising activities that take place in the community. Visit www.cfuwkanata.ca for more information. Front Row left to right : Emma Brown - Earl of March, Jordan Scott - Holy Trinity, Kassie Williams - West Carleton, Alena Thor - All Saints. 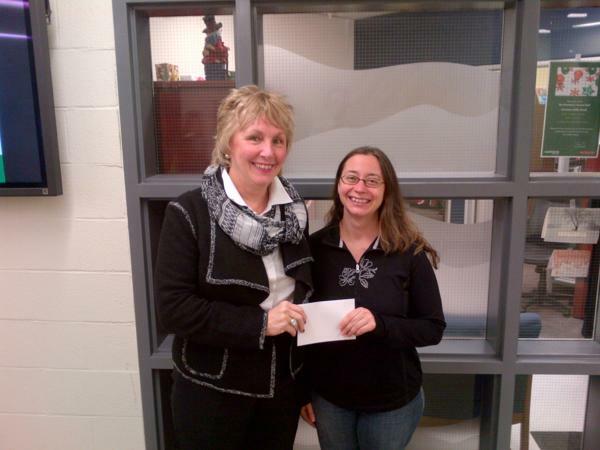 Ms. Tammy Fortier was the recipient of the CFUW Kanata $500.00 Algonquin College Scholarship. Tammy is a first year Dental Hygiene student who is a single mother who returned to school after graduating originally in 2000. She was very grateful for her scholarship and wrote a thank you note to the Kanata CFUW stating how pleased she was to receive it and that it would be a financial benefit for her and her daughter Ella. Brenda Rothwell, Executive Director, Algonquin College Foundation, presented Tammy with her award in November 2012. Danielle Gelineau and Brenda Rothwell, Executive Director of the Algonquin College Foundation presenting the CFUW Bursary to Danielle. Back row left to right: Kendra Matthews-Gramer, Lena Chen, Meghan O'Brien, and Sophia Raytchev. Ms. Jessica Mena is a first year Business Administration student in the School of Business. She had previously been enrolled at another post secondary institution studying International Studies but left for a while and came to Algonquin. Jessica hopes to own her own business some day. Katherine Bell of All Saints. 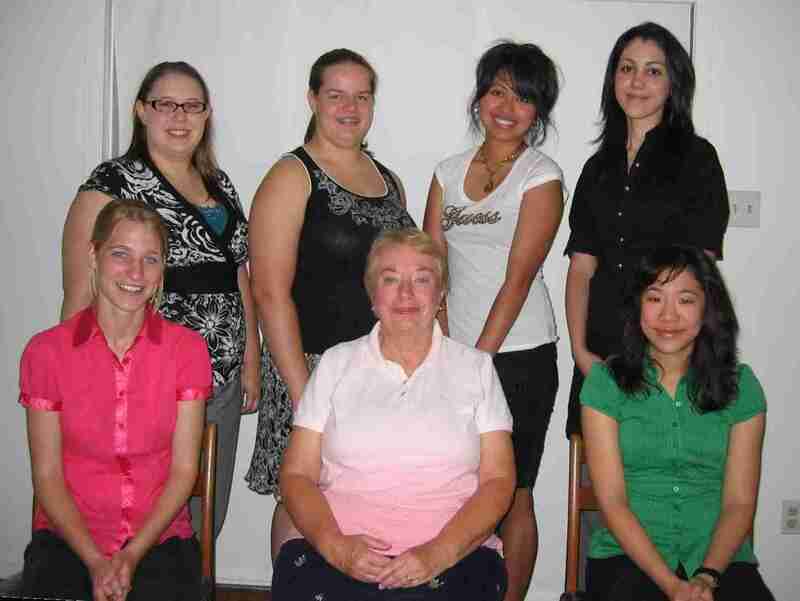 Emily Darling, Judith Whyte (President), Lisa Tran, Marika Bujaki, Janette Bass, Karlyn Madrid, and Sanah Assaad. Absent from the photo is Katherine Bell. Erica Wiebe, Kim Thomson, Elizabeth Pulker (President), Melanie Fortune, and Alicia Cornell. If you know of someone who would be a worthy recipient of a scholarship or book prize, please contact the guidance counselor at their high school.